Journalism is evolving fast in the digital age, and researchers across Europe are working on exciting projects to create innovative new tools and open source software that will support online journalism and benefit readers. As part of the wider Google Digital News Initiative (DNI), we invited academic researchers across Europe to submit proposals for the Computational Journalism Research Awards. 07/11/2016 update - this feature is no longer supported. 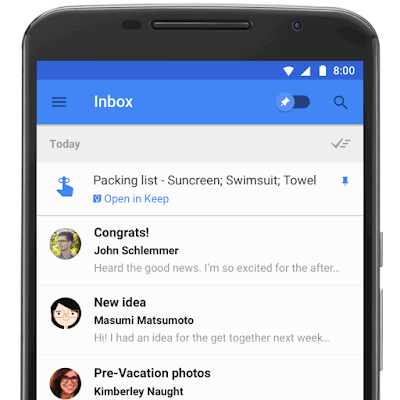 We apologize for the confusion and continue to look for ways to make Inbox for Gmail more useful. 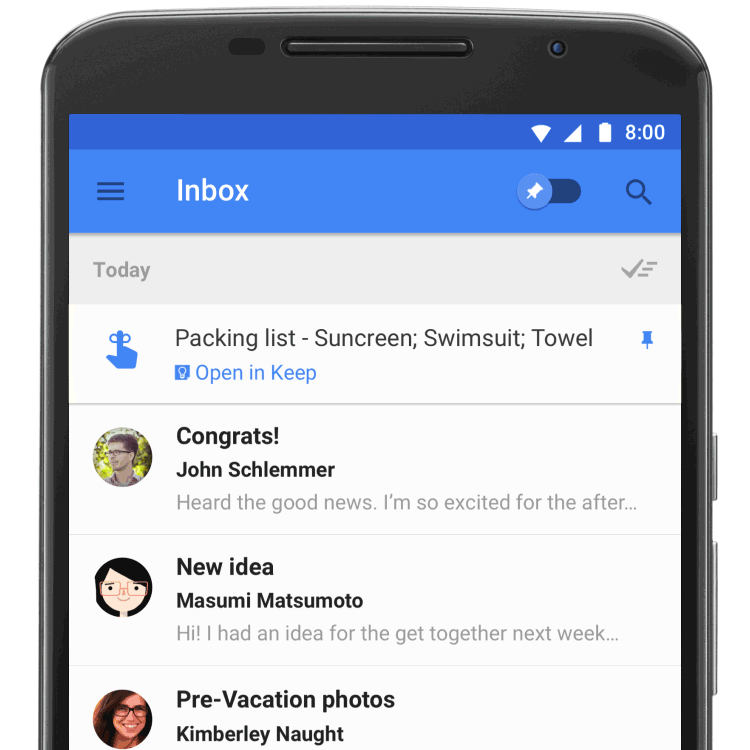 Last week, Inbox by Gmail opened up and improved many of your favorite features, including two new ways to add Reminders. 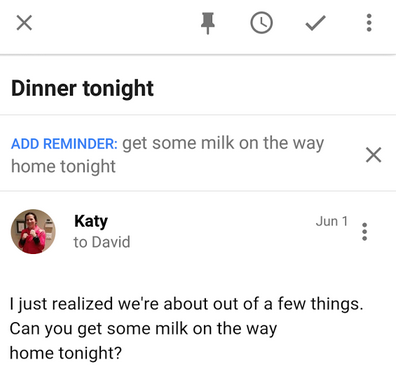 To help you add Reminders, the Google Research team used natural language understanding technology to teach Inbox to recognize to-dos in email. 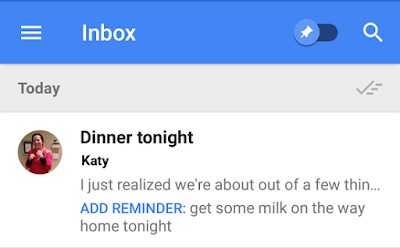 The other new way to add Reminders in Inbox is to create Reminders in Google Keep--they will appear in Inbox with a link back to the full note in Google Keep. Hopefully, this little extra help gets you back to what matters more quickly and easily. Try the new features out, and as always, let us know what you think using the feedback link in the app. Much of the world's data is in the form of visual media. 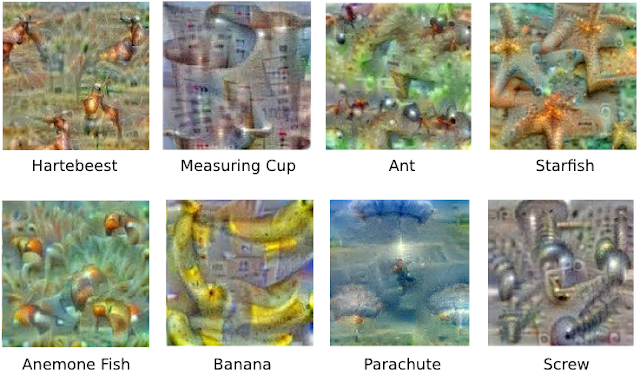 In order to utilize meaningful information from multimedia and deliver innovative products, such as Google Photos, Google builds machine-learning systems that are designed to enable computer perception of visual input, in addition to pursuing image and video analysis techniques focused on image/scene reconstruction and understanding. 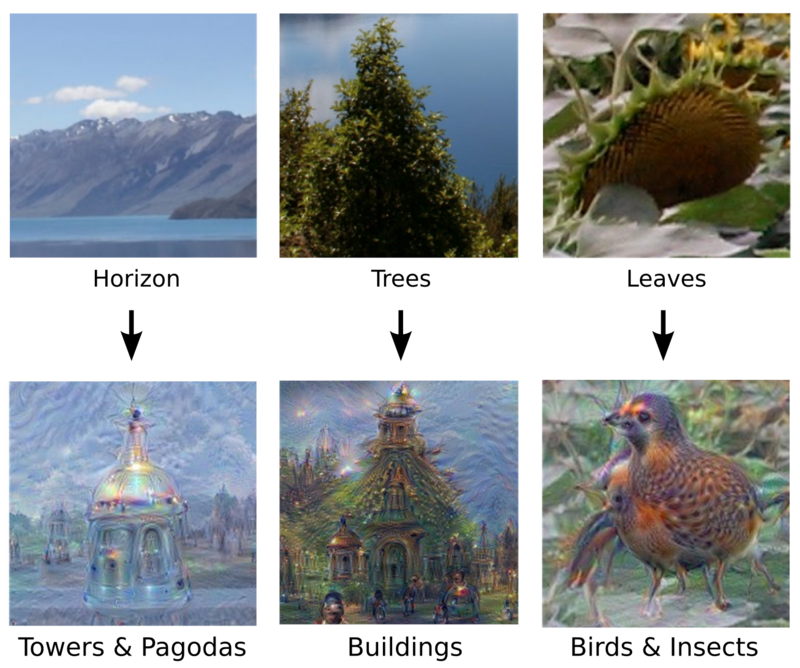 This week, Boston hosts the 2015 Conference on Computer Vision and Pattern Recognition (CVPR 2015), the premier annual computer vision event comprising the main CVPR conference and several co-located workshops and short courses. As a leader in computer vision research, Google will have a strong presence at CVPR 2015, with many Googlers presenting publications in addition to hosting workshops and tutorials on topics covering image/video annotation and enhancement, 3D analysis and processing, development of semantic similarity measures for visual objects, synthesis of meaningful composites for visualization/browsing of large image/video collections and more. Learn more about some of our research in the list below (Googlers highlighted in blue). 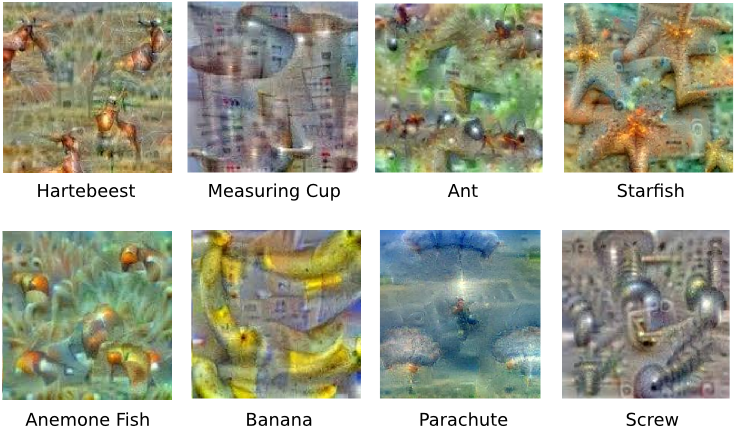 If you are attending CVPR this year, we hope you’ll stop by our booth and chat with our researchers about the projects and opportunities at Google that go into solving interesting problems for hundreds of millions of people. Members of the Jump team will also have a prototype of the camera on display and will be showing videos produced using the Jump system on Google Cardboard. In 2009, Google created the PhD Fellowship program to recognize and support outstanding graduate students doing exceptional work in Computer Science and related disciplines. The following year, we launched the program in Europe as the Google European Doctoral Fellowship program. Alumni of the European program occupy a variety of positions including faculty positions (Ofer Meshi, Cynthia Liem), academic research positions (Roland Angst, Carola Doerr née Winzen) and positions in industry (Yair Adato, Peter Hosek, Neil Houlsby). This group of students represent the next generation of researchers who will endeavor to solve some of the most interesting challenges in Computer Science. We offer our congratulations, and look forward to their future contributions to the research community with high expectation. In Natural Language Processing, relation extraction is the task of assigning a semantic relationship between a pair of arguments. As an example, a relationship between the phrases “Ottawa” and “Canada” is “is the capital of”. These extracted relations could be used in a variety of applications ranging from Question Answering to building databases from unstructured text. While relation extraction systems work accurately for English and a few other languages, where tools for syntactic analysis such as parsers, part-of-speech taggers and named entity analyzers are readily available, there is relatively little work in developing such systems for most of the world's languages where linguistic analysis tools do not yet exist. Fortunately, because we do have translation systems between English and many other languages (such as Google Translate), we can translate text from a non-English language to English, perform relation extraction and project these relations back to the foreign language. 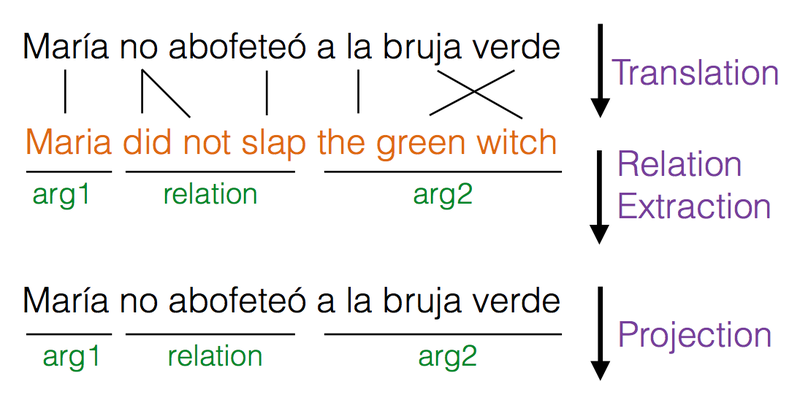 Relation extraction in a Spanish sentence using the cross-lingual relation extraction pipeline. In Multilingual Open Relation Extraction Using Cross-lingual Projection, that will appear at the 2015 Conference of the North American Chapter of the Association for Computational Linguistics – Human Language Technologies (NAACL HLT 2015), we use this idea of cross-lingual projection to develop an algorithm that extracts open-domain relation tuples, i.e. 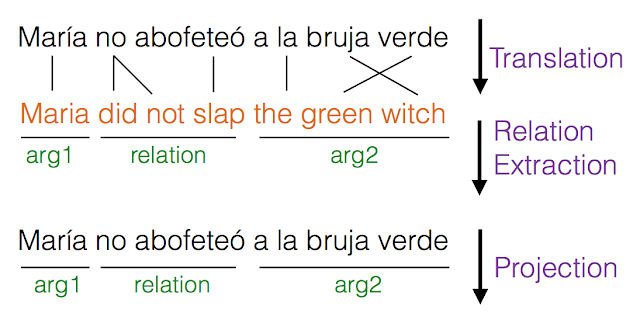 where an arbitrary phrase can describe the relation between the arguments, in multiple languages from Wikipedia. In this work, we also evaluated the performance of extracted relations using human annotations in French, Hindi and Russian. Since there is no such publicly available corpus of multilingual relations, we are releasing a dataset of automatically extracted relations from the Wikipedia corpus in 61 languages, along with the manually annotated relations in 3 languages (French, Hindi and Russian). It is our hope that our data will help researchers working on natural language processing and encourage novel applications in a wide variety of languages. We wish to thank Bruno Cartoni, Vitaly Nikolaev, Hidetoshi Shimokawa, Kishore Papineni, John Giannandrea and their teams for making this data release possible. This dataset is licensed by Google Inc. under the Creative Commons Attribution-ShareAlike 3.0 License.